Welcome to Pachia Ammos Hotel.. At Falasarna beach. Hotel is Located on top of the most famous beach in Crete named Pachia Ammos (Thick Sand) at Falasarna. 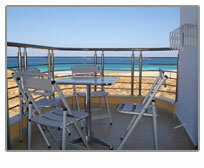 From there you can enjoy the most amazing panoramic view of the beach. Our hotel is a new contruction, that combines the old and the modern Cretan style. Pachia Ammos Hotel, is family owned Hotel. It features fully equipped, comfortable apartments. Is the ideal place if you want to relax and recharge. Our apartments are new, spaciously .... Hotels at falassarna beach, Greece, Rooms for rent at Falassarna beach,Greece.